From April 8th to April 12th, Battelle will be hosting the 11th International Conference on Remediation of Chlorinated and Recalcitrant Compounds in Palm Springs, California. As you may know, this conference is one of the biggest and most anticipated events in the field of remediation. More than 1,600 environmental professionals from state and federal government agencies, academia, consulting firms, leading research organizations and industries from around the world gather to share and learn in cutting-edge knowledge and practices. ENFOS is proud to announce that Roger Well, EVP/COO of ENFOS, will be delivering a presentation on Wednesday, April 11th at 8:50AM in the Learning Lab Demonstration venue (Exhibit Hall). 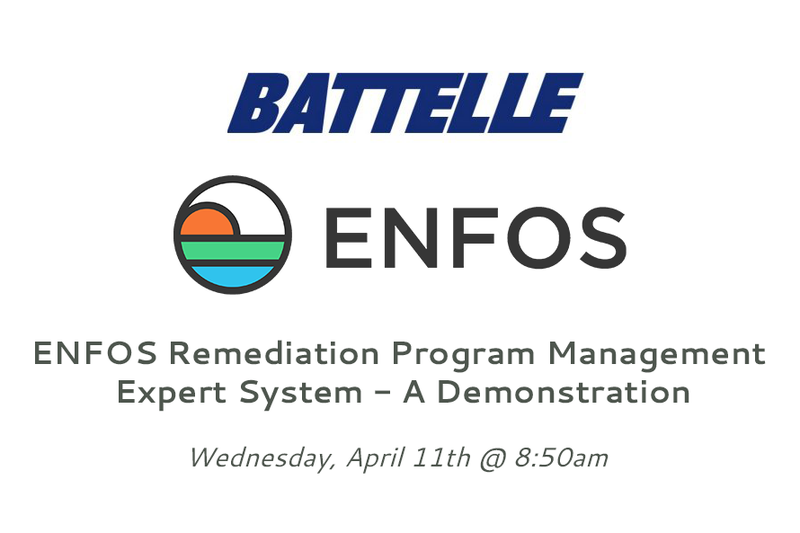 Roger will demonstrate the ENFOS Remediation Program Management Expert System, in which attendees will learn best management practices associated with environmental remediation, liability management and project management controls. Areas of focus will include lifecycle stages, scope of work management, schedule management, and cost management within a framework of automated workflow and integrated business processes. Proper management of remediation project portfolios isn't easy. Come find out first-hand what happens when you integrate an enterprise cloud expert-management system designed specifically for remediation and decommissioning programs. See how all aspects of remediation programs including project portfolio management, financial management, environmental data management, and compliance can be brought together in a single version of the truth, easily accessible to responsible parties and their environmental consultants, contractors, and laboratories. It's not just about making things easier - it's about streamlining and improving the performance of your entire portfolio. Come join Roger at 8:50 AM, Wednesday, April 11th at Battelle's conference at the Palm Springs Convention Center to learn how you can upgrade your remediation portfolio management and save your company some serious time, money and headaches. How Do We Best Measure Remedial Technology Performance?